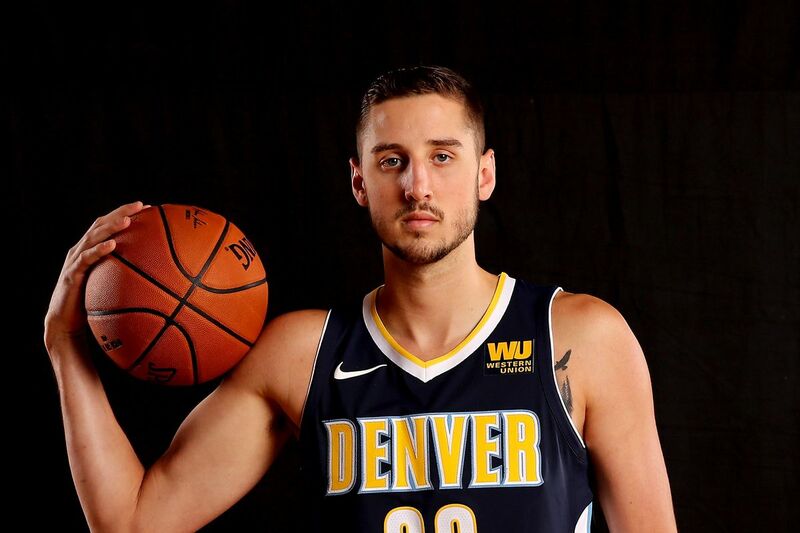 Tyler Lydon is an American professional basketball player who started out from high school and is now playing pro for the Denver Nuggets of the National Basketball Association(NBA). As is customary for most professional basketball players, Lydon played B-ball in college for Syracuse Orange, he was projected to be selected in the late first round of the NBA draft which made him such an intriguing options for an elite team like the Lakers. In 2016, while with the Orange, he averaged 13.2 points, 8.6 rebounds, and 2.1 assists per game. As he continues to improve on his skills and build an outstanding reputation in the game of basketball for years to come, here’s all we know about Tyler Lydon. Tyler Robert Lydon was born on April 9, 1996, in Hudson, New York as one of four children raised by his parents; he has three brothers. Growing up in his birth city, Lydon attended Stissing Mountain High School in Pine Plains and went ahead to spend a prep year at New Hampton School in New Hampton, New Hampshire. After graduating from high school, he enrolled to further his education at Syracuse University and committed to play college basketball for the school’s team. While playing for the Pine Plains basketball team, Lydon led the Bombers to the state Class C finals in 2013, averaging 15.4 points and 11.3 rebound per game that season. During his freshman year at Syracuse University in 2016, the forward help lead his team to NCAA Final Four and as a sophomore, he averaged 13.2 points, 8.6 rebounds, and 2.1 assists. For his two-year career at Syracuse, Lydon scored 47.5 percent of his shots — and 39.8 percent from 3 point range, averaging 11.6 points and 7.4 rebounds. His 40 percent shot from 3 point range while at the Syracuse projected him as a stretch four in the NBA. An ESPN draft expert said his ability to shoot at his size is very intriguing and at 6’9” with a 7ft wingspan, Lydon has potentials as a shot blocker and can protect the rim. Also, according to Nuggets President of Basketball Operations Tim Connelly, Lydon’s versatility was a major selling point. Lydon’s childhood dream came to reality when he was selected in the first round of the NBA draft by the Utah Jazz and later traded to the Denver Nugget. The Pine Plains basketball stand out was picked 24th overall in the 2017 NBA draft and became the second homegrown Dutchess County product to get drafted by the NBA since Poughkeepsie native Rich Rinaldi in 1971. Tyler Lydon made his professional debut in the Summer League game against the Houston Rockets which was broadcasted nationally on NBATV. The 6-foot-9 forward signed his first professional contract with Utah Jazz. Though its terms were not released, words have it that he is guaranteed a place in the team for two seasons with an option for a third and fourth season. The maximum value of his contract according to the NBA rookie salary scale is estimated to be $7.66 million over four seasons. He started wearing Jersey No. 20 for the Nuggets and is believed to have the rare combination of shot-making, size, and rim protection to build a great legacy in the game. Tyler Lydon stands at a height of 6 feet 9 inches and weighs 215 lbs (98 kg). The width of his hand measures 8.75 inches while its length is 8.75 inches, he has a standing reach of 8 feet 11.5 inches with a wingspan of 7 feet. The basketballer is reported to have a body fat of 13.60 percent. Lydon’s physical profile is described as a solid size for a power forward by Draft Express. He is known to possess an improved 223-pound frame but less than an impressive 7-foot wingspan – of course, with room to improve his strength. A fluid athletic prowess, Lydon is a dangerous set shooter with a high release point and has flashed impressive consistency well beyond the NCAA three-point line. Despite his terrific spot-up jump shooting ability, he’s not nearly as effective off the dribble; not overwhelmingly shifty with the ball, but runs the floor well and is quick off his feet when he can build up a head of steam approaching the basket. He ranked 336th best-paid NBA player in 2017 and made 18.69 percent more in 2017/18. He is the 11th best-paid player of the Denver Nuggets, 2018. He has two agents, Andy Shiffman, and Mark Bartelstein.